Universal plastic dumbbell, cement filled, rubber pads, perfect for developing dynamic power. 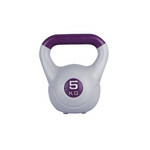 The Dumbbell inSPORTLine Vin-Bell 7kg is a high quality, bell-shaped dumbbell with a triangular handle. Made of high quality plastic, this dumbbell is filled with cement. The solid handle allows for a safe and comfortable workout while the rubber pads on the bottom provide stability when you put the dumbbell on the floor. Suitable for all age/performance groups, the Dumbbell inSPORTLine Vin-Bell 7kg is perfect for developing dynamic power. In Kettlebels and Vin-bells, we can find three types of filling. The first is cement, with the advantage of lower price. On the other hand, when compared to steel filling, its volume is a bit higher. Steel filling is, however, more expensive. The third type of filling is made of fine sand, found mainly in neoprene dumbbells. All types of handgrips ensure safe and comfortable workout. Chromed and steel grips are smooth and resistant to damage. Vinyl and rubber grips provide anti-slip surface and durability. Plastic handgrips can be found on lighter neoprene dumbbells. Dumbbells are most commonly coated with either rubber or vinyl. Both are highly resistant to wear and damage. They are easily washable and comfortable to the touch. The vinyl models are filled with cement, the rubber ones with steel. Neoprene coating can be found on lighter dumbbells filled with sand. Rubber grips can be found especially on vinyl sets. They stabilize the dumbbell in place when it's put on the ground or on a rack. This way, the dumbbell will ot roll away and stay in place.